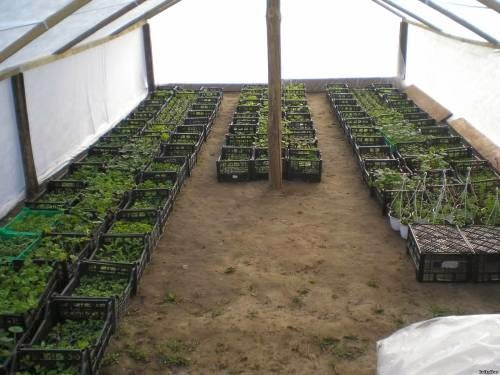 Before planting the seedlings must be educated to outdoor conditions - UV, wind, sharp daily fluctuations in temperature. Hardening begin with, expose the seedlings on glazed balconies and loggias where on sunny days the temperature at 10 ° C above the outside. Cold-resistant culture can be taken from the time when in the shade on the balcony temperature reaches 5-7 ° C.Seedlings thermophilic crops begin to stand for several hours, when the temperature in the shade rises to 10 ° C.
If daytime temperatures above 15 ° C, and at night does not fall below 3-4 ° C, you can not remove the seedlings from the balcony. This accustom plants to dramatic diurnal temperature fluctuations. Yet glazed balconies and loggias not provide this hardening. Hardening seedlings open onto balconies and loggias held in conditions close to the outer, but something even more severe, for example, there is a strong wind. Continue hardening in gardens, surviving seedlings a few days (at least 2-3 days) on the tables set out in the open.